Monica Melissa Patterson listens to testimony from the former board chairman of Comfort House, Timothy Brown, during her capital murder trial in the 370th state District Court at the Hidalgo County Courthouse on Friday, Oct. 27, 2017, in Edinburg. On Monday, both the prosecution and the defense rested their respective cases. 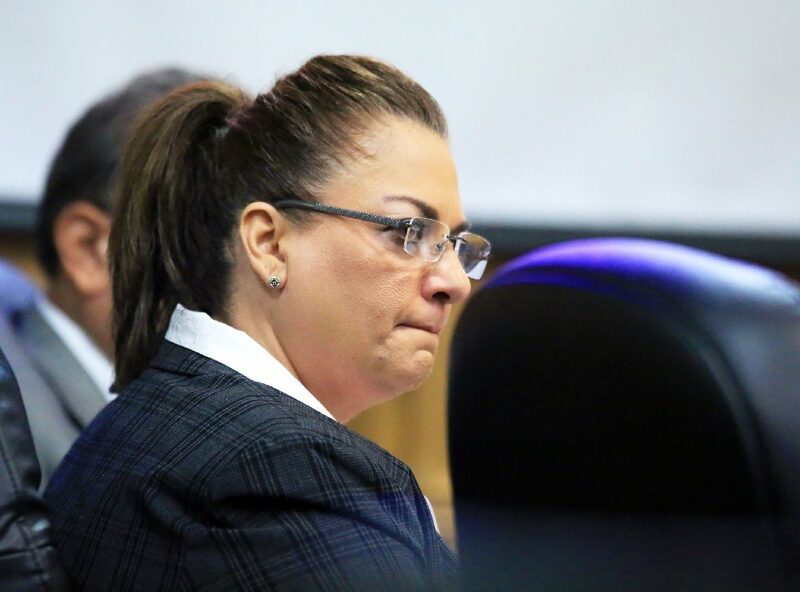 EDINBURG — Timothy Brown seemed to have drawn the ire of Monica Melissa Patterson on Friday as the defendant was often seen nodding her head disagreeably in reaction to the witness’s testimony. Brown served as chairman of the Comfort House board when Patterson was hired in early 2014 as administrator of the nonprofit hospice. He told jurors he had a long history with the organization, having served on its board for nearly a decade, following in his father’s footsteps. Patterson is accused of stealing approximately $200,000 from the organization during her tenure until her August 2015 arrest for capital murder. The charge, as well as the additional counts of theft and misapplication of a fiduciary, stems from the death of a 96-year-old man she met after his wife was admitted to the facility in fall 2014. Brown said that during the hiring process, Patterson did not inform the board of her failed speech therapy business nor the large number of outstanding tax liens in her name. Timothy Brown, former board chairman of Comfort House, testifies during the Monica Melissa Patterson capital murder trial in the 370th state District Court at the Hidalgo County Courthouse on Oct. 27, 2017, in Edinburg. While Brown said that the board gave Patterson “a little leeway” as to certain expenses she could make, she was not given the authority to spend the nonprofit’s money for her own benefit. He told jurors he was unaware of the administrator having a Comfort House debit card — it was from this card that she is alleged to have made many unauthorized expenses. Brown also told jurors he received an anonymous letter at some point after Patterson’s hiring. He was not allowed to discuss the contents of the letter with jurors because it was not entered into evidence. But he did share it with the other board members, spoke with Patterson about it and subsequently reported the defendant to Adult Protective Services. This is likely the letter the Greater Valley Hospice director sent after her staff suspected that Patterson was financially exploiting the victim, Martin Knell Sr.
Brown, a director of a local funeral home, also noted that, based on his education and work experience, elderly people who have recently lost a loved one are particularly vulnerable. “There’s a certain level of professionalism that has to be maintained when you’re dealing with the death care industry and the bereavement industry,” Brown said upon being asked if he would have let Knell spend the weekend at the witness’s home — something Patterson is alleged to have done. During his cross-examination of the witness, defense attorney Ricardo “Rick” Salinas tried to paint Brown as a board member who was “overwhelmed” by his other responsibilities, including his two businesses and family, and who was unable to fulfill his obligations as a board member. Brown admitted that in his final year on the board, he probably hadn’t raised as much money as previous years. Salinas also highlighted that Patterson had been given the authority to open a Wells Fargo bank account, noting that another board member at the time was branch manager at one of the bank’s locations in the Rio Grande Valley. Patterson, however, did not open such an account; rather, she opened an account at Falcon International Bank without the board’s knowledge. Before Brown testified, Hidalgo County Sheriff’s Office investigator Adam Palmer returned to the stand to further detail his analysis of cellphone records belonging to Patterson and Angel Mario Garza, the man also charged with capital murder for his role in Knell’s Jan. 28, 2015 death. The investigator’s analysis put their phones in the vicinity of Knell’s house prior to the 9-1-1 call placed by his live-in housekeeper upon finding him unresponsive. The analysis also put Garza in the vicinity on the evening before Knell’s death — this when Garza placed a call to the housekeeper asking her to let him in, a request she denied. 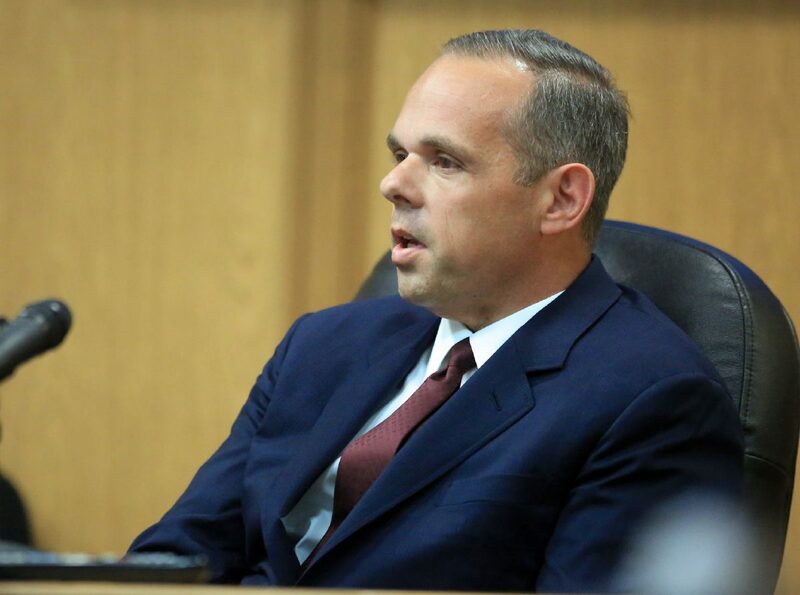 During his cross-examination of the investigator, defense attorney Calixtro Villarreal emphasized what the defense likely considers a few key points that weaken the state’s case against Patterson. Villarreal mentioned that none of the paramedics who responded to Knell’s residence on the morning of his death reported any suspicious activity to authorities. He then pointed out that no DNA evidence from Patterson or Garza was found on the kitchen table, where Knell was seated when Garza allegedly suffocated him with a plastic bag. The defense attorney also highlighted what could be considered a shortcoming in the sheriff’s office investigation into Patterson — this being that they did not check to see if the housekeeper’s prints were on any of the large bundles of cash found in Knell’s safe deposit box. Jurors previously learned that money was missing from these bundles, and while Patterson and Knell are shown on bank security camera footage entering the safe deposit vault, another investigator testified that the housekeeper was waiting in the bank lobby that day. Before state District Judge Noe Gonzalez dismissed the jurors for the weekend, he left them some words of advice as they enter into the trial’s sixth week. The prosecution has yet to rest its case but may do so first thing Monday morning. Prosecutors, however, may also elect to continue calling witnesses to the stand.